More than 26,000 years ago, sea level was much lower than it is today partly because the ice sheets that jut out from the continent of Antarctica were enormous and covered by grounded ice — ice that was fully attached to the seafloor. The ice sheets were as large as they could get and at the time, sea level was much lower because a lot of ice was sequestered on the continent. As the planet warmed, the ice sheets melted and contracted, and sea level began to rise. LSU Department of Geology & Geophysics Associate Professor Phil Bart and his students have discovered new information that illuminates how and when this global phenomenon occurred. Their research recently published in Nature's Scientific Reports may change today's sea level rise predictions as Earth and its icy continent continues to warm. Bart and his students conducted one of the largest geological surveys of the Antarctic continental shelf to-date. His team of undergraduate and graduate students spent 28 days at sea aboard the U.S. Antarctic Programs' research ship, the Nathaniel B. Palmer RVIB, to scan the topography of the seafloor in the Ross Sea. They scanned and mapped a roughly 2,500-square-kilometer, or 965-square-mile, area to create a three-dimensional picture of the ocean floor. The scientists retraced the past movements of the West Antarctic Ice Sheet and its adjacent floating ice shelf as global climate warmed. The ice shelf is a critical part of the climate system, because it slows down the breaking up and melting of grounded ice, which results in sea level rise. The scientists confirmed that the West Antarctic Ice Sheet had begun contracting and a relatively small ice shelf existed by 14,000 years ago. The ancient Ross Sea Ice Shelf then collapsed and calved into the ocean about 12,300 years ago. More recently in 2002, in the northern part of Antarctica called the Antarctic Peninsula, the Larsen Ice Shelf collapsed. The collapse of this ice shelf quickly led to inland glaciers buttressed by the Larsen Ice Shelf to break up and melt. Scientists have thought that a similar process could have occurred when the Ross Ice Shelf collapsed thousands of years ago in the West Antarctic Ice Sheet. However, Bart and colleagues from the University of South Florida, Auburn University and the Polish Academy of Sciences found that there was a centuries-long delay from when the Ross Ice Shelf collapsed and the grounded ice began to contract. In the Ross Sea, the delay was between 200 to 1,400 years later. This new information adds a layer of complexity for sea level rise computer simulations and predictions. The researchers made this discovery by combing through the imagery from their virtual map to find where sediment was being deposited while the ice was last in contact with the seafloor. At those locations, they collected sediment cores, which they analyzed and looked for evidence of fossilized life near the bottom of the ocean. 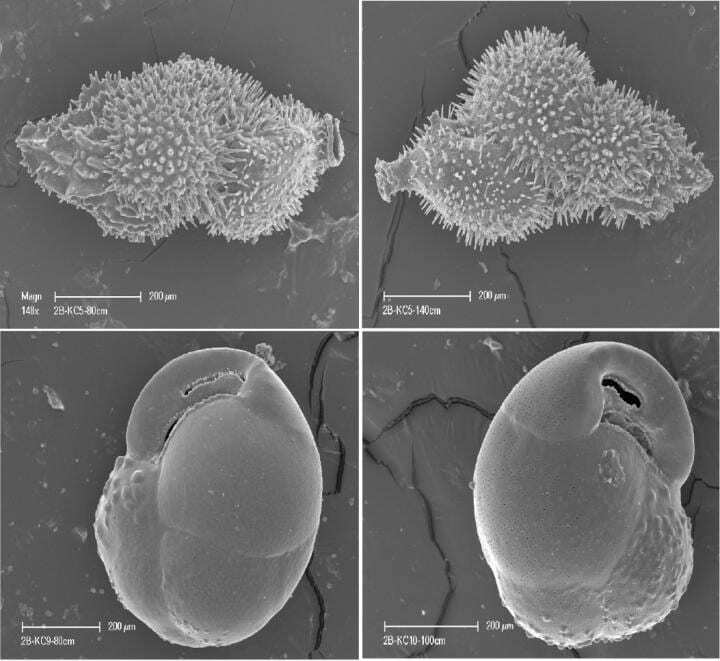 In the sediment cores, they found fossilized shells of single cell organisms called foraminifera. These fossils provide a timestamped footprint that give the researchers an estimate of when the ice was last there through radiocarbon dating. The fossils retrieved from where the ice shelf collapsed are about 200 to 1,400 years older than the fossils found in the grounding line trough. "We know that the West Antarctic Ice Sheet retreated more than 200 kilometers after the paleo-ice shelf collapsed. The radiocarbon dating of this past event is important because it shows that ongoing changes to ice shelves may trigger dynamics whose consequences are realized only after a significant delay," Bart said.